Visit five commercial beekeepers and learn their methods and tricks for requeening and making splits. Almost a full hour of great tips! Essential to the food, drink, religion, economics, medicine and arts of every civilization since the Egyptians, honey - and the bees that make it - have been a vital part of the human record for millennia, appearing on cave paintings, wax tablets and papyrus scrolls. From the temples of the Nile to the hives behind the author's house, men and women have had a long, rapturous love affair with the beehive. Robbing The Bees is a biography, history, celebration and love letter to bees and their magical produce. Holley Bishop follows beekeeper Donald Smiley on his daily tasks then explores the lively science, culture and lore that surround each step of the process and each stage of lives of the bees and their honey. Throughout are the author's lyrical reflections on her own beekeeping experiences, the business and gastronomical world of honey, the myriad varieties of honey (as distinct as the provenance of wine), as well as recipes, illustrations and historical quotes. Combining passionate research, rich detail, and fascinating anecdote, Robbing The Bees is a sumptuous look at the oldest, most delectable food in the world. Narrated by F. Murray Abraham. Silence of the Bees is the first in-depth look at the search to uncover what is killing the honeybee. The filmmakers of Bees take viewers around the world to uncover clues, and even deep inside honeybee colonies. Silence of the Bees is the story of an ongoing investigation to save honeybees from dying out. The film tells the story of the honeybee itself, its invaluable impact on our diets and takes a look at what’s at stake if honeybees disappear. Silence of the Bees explores the complex world of the honeybee in crisis and instills in viewers a sense of urgency to learn ways to help these extraordinary animals. The most joyful emanation produced by a colony of bees is known as the “song of increase”—declaring that the hive is flourishing and the bees are happy in its abundance. "Song of Increase" takes us inside the world of the honeybee to glean the wisdom of these fascinating creatures with whom humanity has shared a sacred bond for millennia. "Song of Increase" focuses on hidden aspects of apiculture that lead us naturally to more sustainable practices. Freeman illuminates the unity consciousness that guides every action in the colony and how this profound awareness can influence the way we see both the natural world and ourselves. Each chapter presents a wealth of information about the life of bees, including Freeman’s personal insights and direct teachings received from the bees themselves. There are 360 formulas (recipes) for making products that contain honey and beeswax. A good reference book for beekeepers, herb enthusiasts and anyone who wants to know the ingredients in the products they use. Just like fishing you can catch your own bees. Nothing better than free bees! All you need to know are the tricks and this 50-minute presentation will show them all! 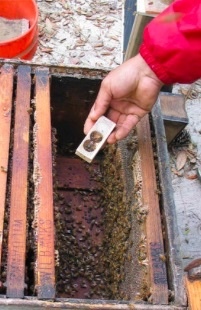 The definitive guide to catching free bees using swarm traps and bait hives. A comprehensive how-to for beekeepers. Based on the fact that bees will occupy a cavity of about 40 liters, a swarm trap is made to create the ideal space for a wild swarm to occupy. Thereby, the bees come to the beekeeper so that the beekeeper doesn't have to go hunt swarms.